This is one of my new favorites, super easy to make too. Rinse a can of organic chick peas- I tried in vain to use the dried ones- I let them sit in water for like 2 days, they never softened enough. I also have tried the boiling method and well, they just don't taste good. 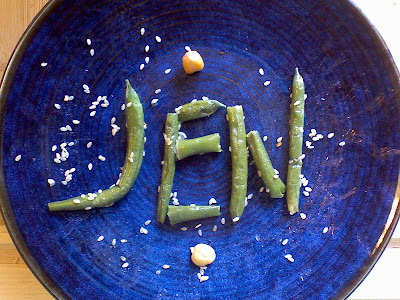 I like best to use fresh green beans too, but I'll use frozen when I have to. Never canned, they're just mush. 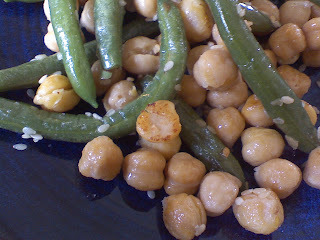 Put the chickpeas and the green beans in the pan at the same time, add about one tablespoon of toasted sesame oil and sautee. Yes, I sautee with toasted sesame oil. Maybe I'm not supposed to, maybe it's got too low a smoke temperature or something but call me crazy, I do it anyway and it comes out very nicely. Just before I'm done I salt the dish, turn the heat up to super high and stop moving things around in the pan so everything can brown on the bottom. Let it sit on the high heat for about a minute. Sometimes I sprinkle raw sesame seeds as a garnish, more often I add them to the pan while cooking- when they get some oil and brown up they're delicious. Simple, vegan, delicious. Slightly nutty, very filling. And you can spell people's names with the beans while you're eating.